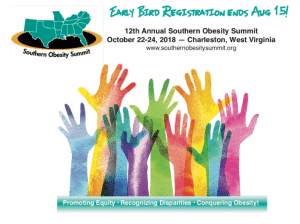 The 12th Annual Southern Obesity Summit is coming to Charleston, WV on October 22-24, 2018. To get registered for the Summit, simply click here. The Coronary Artery Risk Detection in Appalachian Communities (CARDIAC) Project is a chronic disease risk factor surveillance, intervention, and research initiative aimed at combating the unacceptably high prevalence of heart disease, obesity, diabetes, and other chronic illnesses in West Virginia. The CARDIAC Project has screened over 200,000 children in the school setting and provided school-based interventions to promote healthy eating and physical activity in children. The project began in 3 counties in WV in 1998, and expanded to all 55 WV counties by 2016. The CARDIAC Project has provided risk-factor screening of over 200,000 children in the school setting and has influenced policy at the state and national levels. The Adolescent Pre-Diabetes Prevention Program identifies and assists adolescents who are pre-diabetic or at-risk for becoming pre-diabetic to reduce their risk factors. Screening and education is utilized for this intervention. With informed consent, the program performs pre-diabetes screenings. Eligible students are enrolled and participate in three screenings each academic year measuring height, weight, blood pressure, BMI% and A1C levels. Six educational lessons designed to provide tools to help reduce risk factors for pre-diabetes are offered. To increase health awareness among faculty and staff at participating schools, an annual health screening is provided. In the school setting, students are screened and given point-of-contact counseling with enrollment in the program if they meet criteria. 29 high schools, 13 School-based Health Centers, and 3 Program Partners participate in the initiative.